Get feathered, spa-ed and sweaty this week. BEAUTY: Farrah Fawcett birthed the feathered hair phenom back in the ‘70s. Today, however, feathered hair takes on a whole new meaning and trend at Control salon. 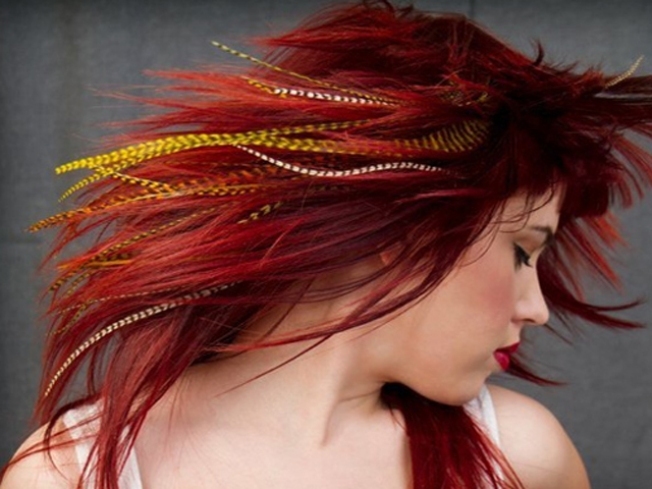 The cool, artsy salon in Wynwood will do up your ‘do with Featherlockshair extensions. Made from real feathers, these colorful accessories have taken flight with celebs like Steven Tyler, Beyonce and Kesha. Beaded into hair, these extensions last several months and add a pop of color and a hint of cool to your hairstyle. Stylist Amy will help you select the right color and thickness combo for your mane. Choose from pink, blue, white, brown, yellow, red and many, many more. The salon’s owner, Liz, is currently working with Featherlocks to offer Puppylocks extensions for pets, as modeled by Bruno, the salon’s adorable and well-feathered Yorkie mascot. You know what they say, birds of a feather flock together. And soon, you and your pooch may be able to do just that. GET IT: Feathers are $16 each for thin or six for $85, $24 for thick or six for $130. The application is $10. 2814 N. Miami Ave., Miami; 305.573.6910. SPA: It’s baaaa-ck. And may we just say, welcome back Sip & Spa Thursdays at The Palms Spa. Starting June 2, the spa-tastic event returns with 50 percent off all spa and salon services from 1 p.m. to 9 p.m. Book for the night or an upcoming Sip & Spa Thursday. There will also be free mini spa treatments on the menu for the big event. Hungry after all that spa-ing? In addition to super spa deals, get half-off appetizers and cocktails from 6 to 10 p.m. Freshly spa-ed and satiated. Who could ask for anything more? GET IT:Call 305.908.5460 to make your appointment. The Palms Hotel & Spa, 3025 Collins Ave., Miami Beach; 305.908.5458. GYM: It doesn't take much to work up a sweat in Miami. We've got the heat—and we aren't talking about the basketball team. Turning up the temp is newly opened Bikram Brickell Hot Yoga Miami. The studio started off its arrival with an opening party of epic proportions. Owner Ignacio (Nacho) Cano Adres lit the lanterns, received a key to the city and turned up the volume for a Bikram bash. As the largest Bikram studio in Miami and the only one to offer Spanish classes, Bikram Brickell's classes detox the body and help its yogis loosen up enough to find a state of nirvana in their asanas. And it all happens in a 105-degree room, designed by Nacho Garcia Vinuesa, one of Spain and Miami’s famed interior designers. There are also eight private dressing rooms and showers to wash off your workout when you’ve bid Bikram namaste. A special one-year membership rate of $599 is available until May 31.GET IT: 90 S.W. Eighth St., Miami; 305.416.0251.